When an invite arrives, from Mr Dundas, for a Dom Perignon tasting and light lunch at M Restaurant (only 5 mins from the office) it’s not the hardest “yes” ever. The focus here was around the launch of the 2006 which I have tasted and liked. 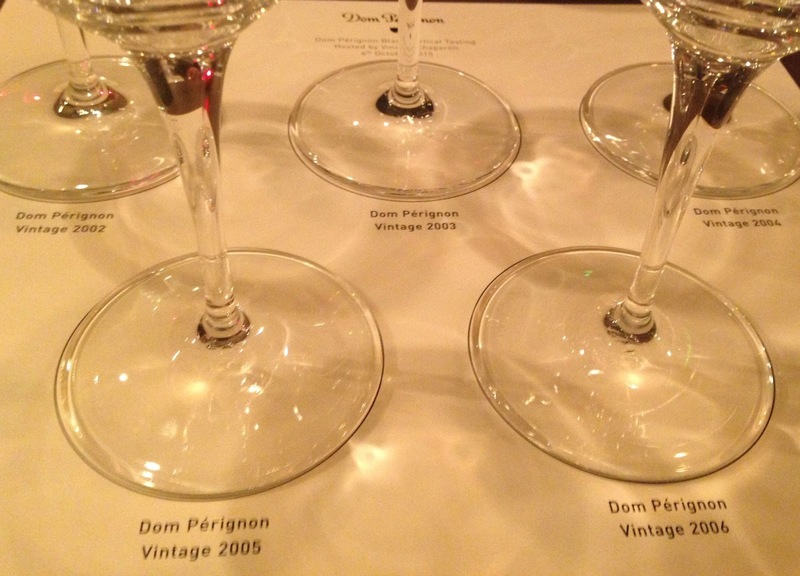 To set the 2006 in context we also enjoyed the previous four vintages. It is a run of five consecutive vintages and that happens rarely. We, including lots of trade colleagues and friends (some, yes you Rupert/Gareth, not understanding that you wear a tie in the city but I’ll get over it), sat down to be led through the wines by Vincent Chaperon who has “only” been at Dom Perignon 15 years and is very much Richard Geoffroy’s right hand man. I have always liked Dom Perignon – I don’t have any particular need to as commercially it is significant but not a life changer and in many ways someone working with lots of smaller estate, as I am lucky to, ought/might like to find the scale “DP” a little vulgar. BUT, here’s the thing, DP remains one of the few examples in the wine world of signifiant volume alongside very good to great quality. They look to make DP every year, obviously this won’t happen but less vintages are being skipped as the weather seems (I’m not starting on global warming here) to be getting more “optimal” each year. Vincent led the tasting very well and seemed to invent his own word along the way – “Creamosity” – which went straight in all the note books. 2006 – A few notable comments on the growing season from Vincent; one of the longest harvests, a warm and dry September was key as August had not been good. So to the glass and tasting. The nose was intensely tight with an almost Chablisesque character. Very much the Chardonnay showing at the moment. Taught with lemon and lime citrus notes which then turn more to green mellon as the wine calms in the glass. The minerality is stoney and the volume in the mouth very good. There is no nuttiness as yet. The wine overall gives a very good, complete, feeling. I see no obvious reason why this will shut down. 2005 – This vintage is only 45% Pinot Noir but the reason behind this is that the Pinot Noir was very good, too much more than this amount in the blend would have been “overpowering”. The vintage’s challenge was Botrytis. There is immediately more weight to the 2005. More opulence, but also more simplicity. There is almost a heaviness to this, a density. Somehow I don’t “get” this. It is more “gourmand” bigger and bolder. 2004 – Lovely nose, completeness again, no rough edges. Not overly expressive, refined and poised. A little yeastiness just showing. There is a drier fruit character nose. This is the opposite of showy, a drinkers wine. Quite a savvy buy and one to be a little patient with. 2003 – Vincent described this as a wine with “Gravitas” and I see where he is coming from. It was well reported as a bizarre year with exceptional temperatures. I had an open mind but in truth was not expecting too much. The nose was immediately bolder (especially after the restrained 2004), richer and the character that struck me was more Meursaultesque. There was an unctuous almost lactic feel to the wine and it is every bit as much a wine as a champagne in my view. There is a yeasty nutty finish also but not short or heavy. It will be fascinating to see how it ages…I really liked it. 2002 – The last wine of the tasting and from one of the most hyped Champagne vintages of recent decades. Rich, almost reduced, bold in style. Lovely nose of yeast, toast, toffee, hazelnut and cream, then Creme Brulee. It is high toned and extrovert, there is also a note of cocoa bean just peeking though. This is in the next stage of its life. It’s for the hedonist. It will be seriously fascinating to see how this wine varies in character and evolution over different formats but also over the later (P2 /P3) releases that they do. There was a good discussion, post tasting, about the later releases – P2/P3 – and how they sit in the range. I guess time will tell and there were different views on how much production should/could go into each level in % terms. An amazing phrase also got an outing in regard of the pricing differences – “economic apartheid” (more writing in notebooks). I came out of this thinking that possibly, for reasons of extreme conditions, the 2003 will be one of the most fascinating to follow. Thank you Vincent and thank you Jack!